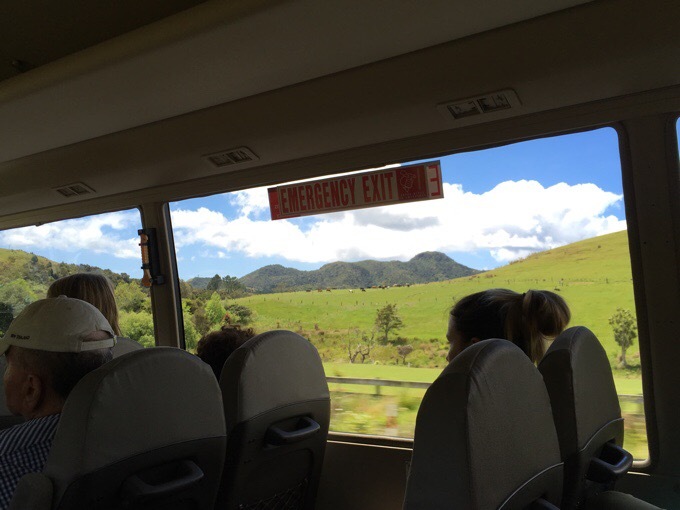 The goal of the day was to not get sick on the 6hr winding bus ride north from Auckland to Kaitaia. I don’t like taking medicine if I can help it, and haven’t taken Dramamine since I was a kid, so I decided to give it a go without any medicine. I’ve heard of many little tricks to help alleviate the nausea but didn’t try any of them. I stuck to the strategy of sitting near the front and forward. Although I’m still spinning some now, I’m pretty happy that I made it. The French gal that sat next to me, that was only riding for 3hrs wasn’t so lucky and looked miserable. I felt her pain. She was even into sailing, so I was surprised she got sick so quick. I slept, or tried to sleep most of the way. I knew I wouldn’t be able to do much on the bus, so I stayed up late the last two nights getting things done figuring I’d sleep it off on the bus. The bus went through some of the towns I’ll be hiking through on the way back south I purposely didn’t look at much and wanted to experience it for the first time on the hike. 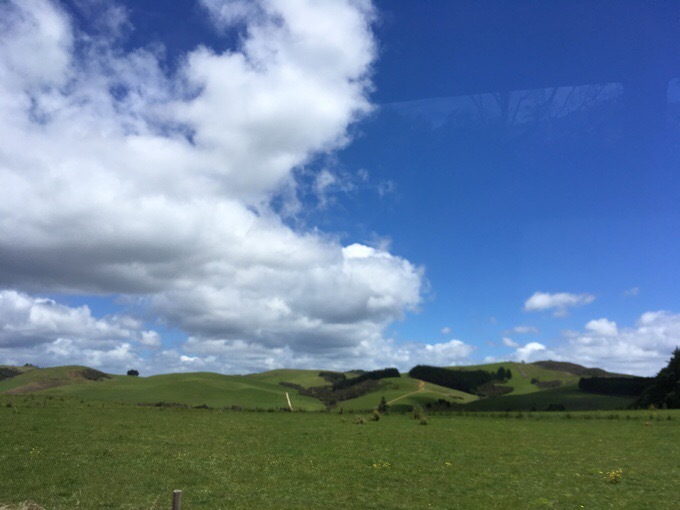 It was quintessential New Zealand with farmland, rolling green hills, and bays of water. It feels less surreal and more normal to be here than Australia for some reason. Maybe it’s that I’ve read some journals on this hike and seen photos. I was focused on keeping the nausea somewhat at bay, so I used my jackets as a pillow against the window seat and was in and out of sleep most of the ride. 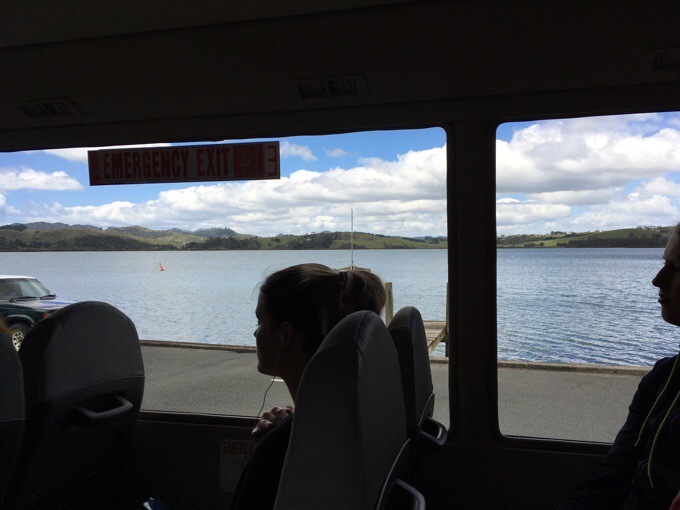 The final two hours, there were fewer passengers, so about 25 of us were moved to a smaller bus that wasn’t as nauseating. Around me, were many foreigners having conversations, but I was oblivious to it until the final stop when a couple got off, and when they pulled their luggage out from under the bus, they both had Gossamer Gear packs like me. That was a surprise as I heard most out here carry heavier gear. I asked the guy near me that was talking with them if they were doing the TA, and he said they were and he was too. They were getting off early in the hopes of hitching to the start of the trail from there today. I was surprised and inquired if that was common as my plan was to do that in the morning as I was under the impression that it could be a lengthy process. He seemed to think it was common to do, and that planted the seed that maybe I could get there today and avoid a hostel stay in town tonight. The guy I was talking to was German, a very lightweight backpacker, and was headed to the start with another woman from Germany who just needed the security of traveling with someone to the start. When we got off the bus at 2:30pm, an Englishman was also doing the TA, but going to the hostel tonight. 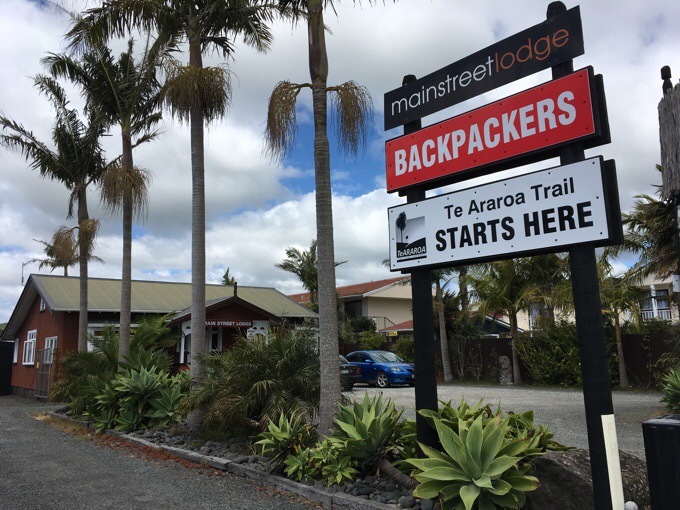 Kaitaia is much bigger than I expected and it is also the first trail town I’ll hit in about 4 days. The German pair had errands to run before attempting to hitch, and I walked with the Englishman to the hostel. I had booked the hostel online and though I’d check and see if I could get it refunded. They said no, but then I luckily had another woman walk in that was able to take my spot and pay me cash for the room. It was fate, time to try hitching. 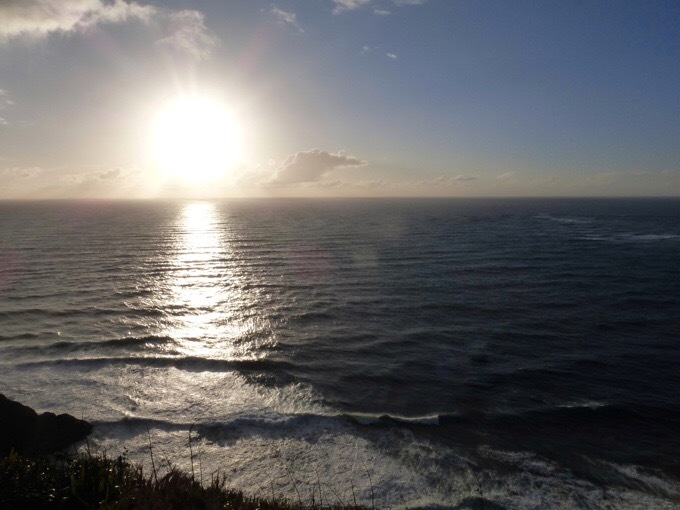 I didn’t realize that a) sunset isn’t until 8pm here (it was around 6:45pm in Australia) b) the road between Kataia and Cape Reinga has many other small villages and camping options if I didn’t find a hitch all the way tonight. I’ll talk about the resources I have for the TA in more detail tomorrow, but I have to say that much is left to the imagination., I was not sure if there was any sheltered camping before the 7mi/12km mark plotted on the maps. Anyone that knows me, knows that I detest planning, but like having a plan. I have planned less for this hike than any other hike I’ve done before. Again, I’ll go into more depth with this tomorrow, but It’s a very odd feeling as the spirit of this trail is to take it one section at a time. That’s both quite freeing and unsettling for me, but I’m trying to embrace this. What better than to start the trail off impulsively tonight! 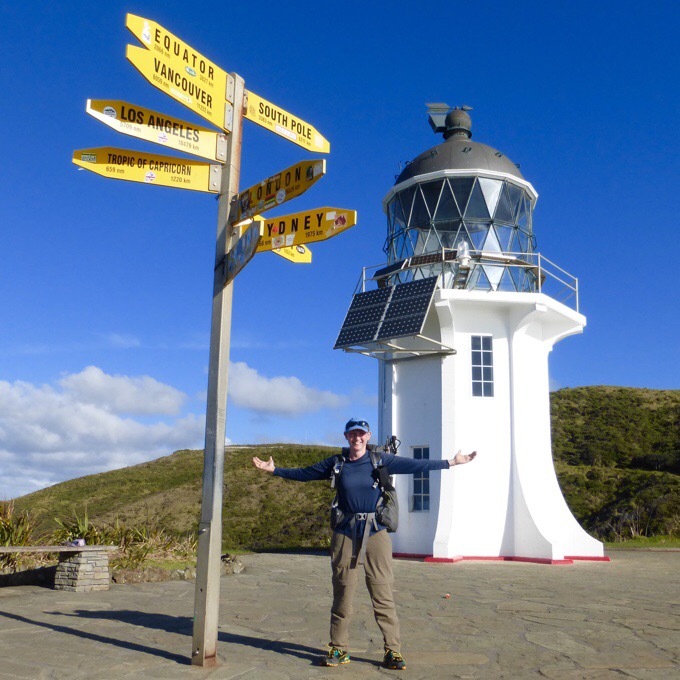 I walked to the end of town a good 15mins and started hitching the 68mi/110km to Cape Reinga at 3:30pm. 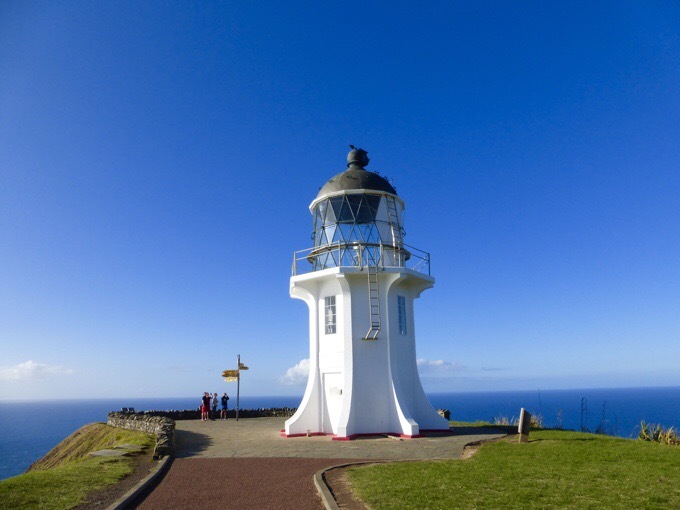 It took me three hitches and 1hr 15mins to get halfway to Cape Reinga. Everyone is super nice. I got the hitches from locals on their way home from work or fishing. They knew about the trail and were used to having backpackers trying to hitch that road to get to the start. It was approaching 5pm and I was at a small stop with a local restaurant and a camp park nearby. I asked an older couple leaving the restaurant and they immediately said no seeming a bit surprised. I headed to the corner to hitch and was contemplating just camping and starting again in the morning. 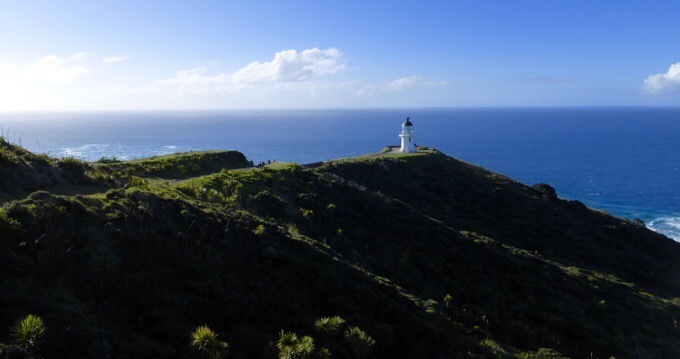 Then a few minutes later, the older couple came up and offered me a ride admitting that they were headed to Cape Reinga. Score! 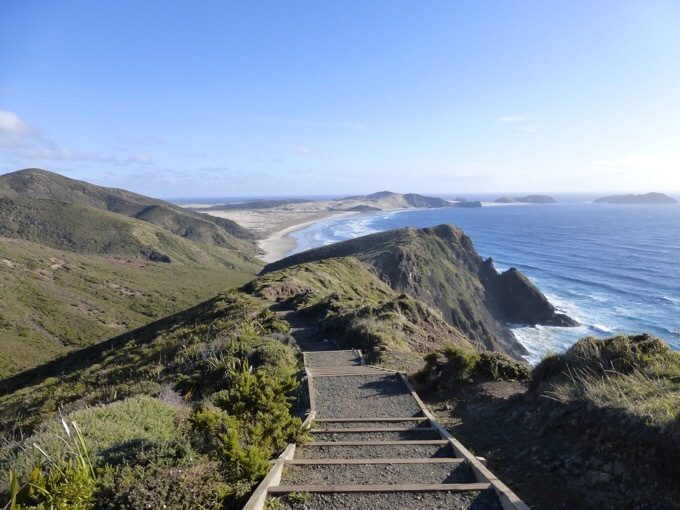 I was at the Cape Reinga parking about 6pm and there were a handful of cars there. It appears that tourists head out for sunset. When we were a solid 5mi/9km out, we passed what may have been that same couple with the Gossamer Gear packs. I tried to get the couple driving me to pick them up as well, but they weren’t interested. I felt bad as the couple seemed to be walking, and in a bind with few cars heading out, and were pushing it with few people heading out that late. 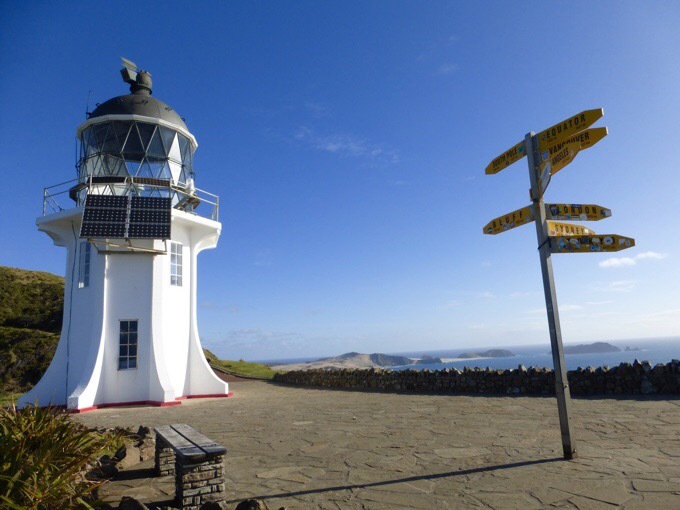 Two of the guys that gave me a ride earlier mentioned a formal DOC (Dept of Conservation) campsite on a side road before the lighthouse. We tried to go there, but it was much too far, so I figured I had plenty to time to find a campsite if I went ahead and started since it would be light out well after 8pm. I got someone to snap some start photos and was shocked it was all happening already! The signs there are fun and they have them at the end of the trail as well when I get to Bluff at the southern tip of the South Island. Point to point, I was 784mi/1452km from Bluff, but the trail is actually 1,898mi/3,054km from Bluff. I’m 5709mi/10478km from Los Angeles. 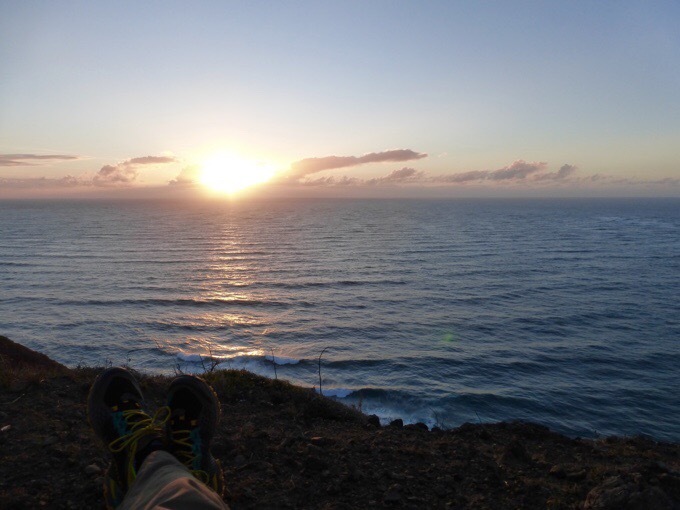 The trail starts off with a bang with a 1mi/2km ridge walk toward a beach. 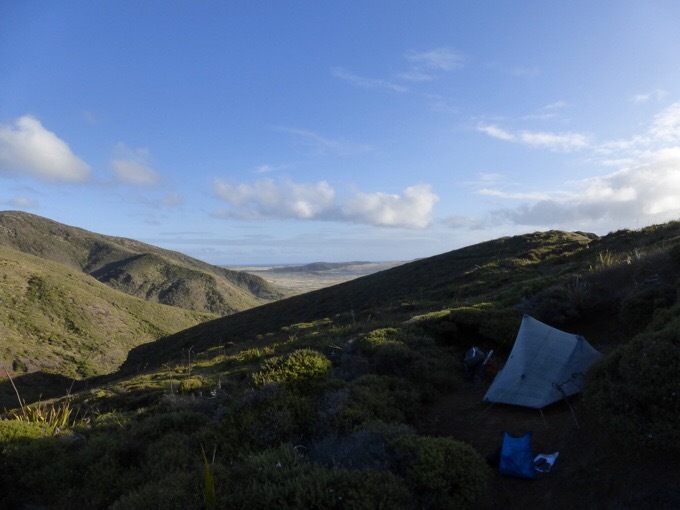 Almost immediately I started seeing possible campsites just off the ridge. They were too perfect to pass up, so I grabbed a spot just .6mi/1km after the start. The main requirement for me is that it’s well protected. The weather can change on a dime out here and it seems to at least mist some each day. Tonight’s clouds look like they want to rain, but the forecast has it as clear for the next 24hrs so we’ll see. The bonus was that I got to watch my first NZ sunset as I ate dinner. I had not planned on camping tonight, and was still feeling nauseated, so I had the bonus ramen I’ve been carrying for quite awhile. Yep, I’m really happy I went for it and had fun with the whole process. I didn’t see anyone else from the bus today, but twice tonight after dark, I could have sworn I heard a tent zipper. There is a chance someone is camped up above me on the trail and neither of us can see each other. If so, I might find out if anyone is camped nearby in the morning. I can hear the ocean lightly and there is a slight breeze. Great sleeping weather! I can see the light strobe from the lighthouse overhead too. Also, no birds! Those birds in Australia were killing me with the 4am wake-up calls. I’m going to sleep really well tonight. 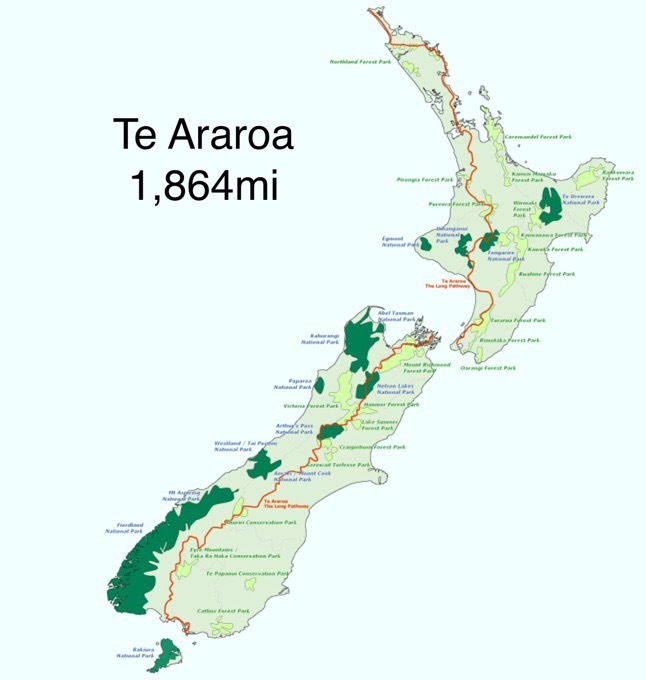 We’re on the Te Araroa everybody!!! Exciting!! Good for you for going against plans–this is the type of trail to do that. Don’t worry, the 4am wakeup call from the birds will come in the upcoming forests!! And it’s begun! Even if I don’t comment on every post be sure I will be reading them all! Enjoy! I have so enjoyed your blog! And am following it daily. Your are part of my inspiration of taking on the A.T. this coming March. Enjoy New Zealand Wired! Oh cool! I’m sure you’re aware of my thoughts on the AT. Hope you meet some great people and bring some music and audiobooks for Harpers Ferry-Vermont! Have a great one! Off we go on another adventure. My second time since I followed Why Not! I’m totally reading hers daily to know what to do! Yep, you know her so well, you know what is good to do and what you would do a bit differently. She met interesting people, and it sounds like you have done so already. That last sunset shot is so rad! Glad you compressed the beginning of your journey and are safely out there now. Have an amazing time! Go!Wired!Go! Beautiful sunset photo!! You’ll have to publish a book! !